Diabetes Mellitus is a challenging disease and complications are vulnerable. Here the author presents a article with a case for inspiration on diabetic retinopathy , which can be supported with homoeopathic remedies. This article is authoured by Dr Rajeev Chaudari and co authored by Dr. Mohan singh . They practice at Badun, Uttar pradesh, India. Nonproliferative retinopathy develops first and produces increased capillary permeability, micro aneurysms, hemorrhages, exudates, and macular edema. Macular edema causes vision loss if untreated. Proliferative retinopathy is characterized by abnormal new vessel formation (neovascularization), which occurs on the vitreous surface of the retina and may extend into the vitreous cavity and cause vitreous haemorrhages. Vision loss with proliferative retinopathy may be severe. Symptoms, Signs, and Diagnosis of Nonproliferative Retinopathy- Vision symptoms are rare in the early stages; as retinopathy progresses, macular edema may cause decreased visual acuity. In late stages, cystic changes from chronic macular edema and macular ischemia from capillary occlusive disease may develop. The first signs are often venous dilation and small red dots (capillary micro aneurysms) seen on funduscopy in the posterior retinal pole. Later cotton-wool spots (soft exudates). Cotton wool spots are areas of micro infarction that lead to retinal opaccification. Proliferative Retinopathy- Symptoms include blurred vision and black spots or flashing lights in the field of vision. Vitreous hemorrhage or retinal detachment may occur, leading to sudden severe vision loss. 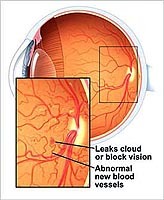 It is diagnosed when fine preretinal capillaries are observed on the optic nerve or retinal surface. Retinal haemorrhage may develop in the vitreous cavity when these abnormal vessels are damaged. In extreme cases, retinal detachment may occur with white preretinal membranes forming over the retinal surface. Detachment and contraction of the vitreous gel contribute to retinal detachment by pulling the retina anteriorly from its attachments over the major vessels. 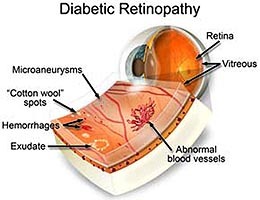 Control of diabetes and BP is important; intensive control of blood glucose can delay onset and slow progression of retinopathy.Homoeopathy can play a great role in the treatment of retinopathy either proliferative or nonproliferative. Homoeopathic literature is full of drugs capable of reducing macular edema and may provide better visual improvement. But with the possible exceptions of vitreous haemorrhage and retinal detachment, lost vision is seldom recovered, but still Homoeopathic drugs are there to prevent further loss. With careful selection of Homoeopathic drugs one can diminish or eliminate proliferative retinopathy and neovascularization and decrease the risk of neovascular glaucoma. It is important to note that constitutional medicines selected on the basis of mental generals and causations are capable of showing good results. It is also quite useful in patients in whom surgery is deferred especially patients with hypertension, very old age, severe diabetes etc. Homoeopathic drugs like Arnica, Physostigma, Sanicula, Phosphorous, Lachesis, Bothrops, and Cineraria are effective in the treatment of proliferative and nonproliferative retinopathy. Ailments from care worries, ailments from fright, dreams of falling, blood, body parts pinched, fear of dark, frightened easily, desire for company, consolation ameliorate, sympathetic, angered easily, desire for salty thing, blurred vision, heaviness in eye, headache. Increased thirst with dryness of mouth. The case was repertorised on the basis of mental symptoms and Phosphorus was selected for prescription. Phosphorus 1000/single dose was given followed by Placebo for 2 weeks. No dreams were repeated, tendency to anger was as such, vision was stable but patient reported recurrent headache especially during eyestrain. Sangunaria 30 BD was prescribed for 2 weeks. No high potency was repeated. No dreams were repeated, tendency to anger was reduced, vision was stable and headache was not reported. Placebo was given for 4 weeks. Dreams of falling was repeated, tendency to anger was reduced, and thirst was normal, vision was stable, no headache was reported but smarting pain was reported in both eyes. Phosphorus 1000/single dose was repeated followed by external use of Cineraria Maritima 2-2 Drops B.D. for 4 weeks. No dreams were repeated, vision was stable, no headache and pain in eyes was reported, Placebo was given for 4 week. No dreams were repeated, vision was stable, no headache and pain in eyes was reported. Placebo was repeated for 4 weeks. Patient was advised to go for Funduscopy. Funduscopy dated 18/12/06 showed marked improvement in capillary microaneurysms. Dreams of falling repeated with dreams of dead relatives. Phosphorus 1000/single dose was repeated followed by Placebo for 2 weeks. The case continues with improvement. Lids agglutinated in morning. Lachrymation in cold open air or cold application. Eyes burn, exuding a sticky fluid. Dandruff of eyebrows. Sight dim. Cornea ulcerated. Photophobia. Blood eyes with burning. Glaucoma. Contraction of pupils. Profuse lachymation. Increasing myopia. Eyelids tense, Night-blindness, Photophobia. Muscae volitantes, flashes of light. Increasing myopia. Vision trembling. Eyeballs feel large, stiff, Choroiditis. Fatigue of eye and head even without much use of eyes. Edema of lids and about eyes. Glaucoma. Cataract. Vitreous opacities. Atrophy of optic nerve. Black points seem to float before the eyes. Green halo about the candlelight. Letters appear red. Thrombosis of retinal vessels and degenerative changes in retina. Retinal trouble with the lights and hallucination of vision. Defective visions after diphtheria, sensation as of eyes were drawn together by cords, which were tied in a knot at root of nose. Blindness with lung or heart disorders. Eyes watery from pain. Intra-ocular haemorrhages. Feels as if eyes were forced out on pressing the throat. Dim sight. Conjuctivitis with measles. The eyes water all the time. Acrid lachrymation, bland coryza. Thick, acrid, yellow discharge from the eyes. Profuse hot or acrid tears worse open air, Pressive, cutting pains in the eyes. Sticky mucus on cornea, must wink to remove it. Pressure in eyes. Little blister on cornea. Cataract with watery eyes. Opacities of cornea after injury. Chronic sore eyes. Bloodshot. Retinal haemorrhage. Black eye. Bruised, sore feeling in eyes after close work. Must keep eyes open. Dizzy on closing them. Feel tired and weary after sight seeing, moving pictures, etc. Photophobia. High objects appear to lean forward and about to fall.